I've lived in the Redland Shire throughout my life. Music has been an integral part of my life for as long as I can remember. I started to play guitar when I was barely old enough to walk. My parents have film of me, still in nappies, watching Elvis Presley singing All Shook Up and copying his every move and vocal nuance. In the clip I'm playing a Ukelele, strapped around my neck, and singing into a wooden microphone that my father made for me. I may not have played well, at that stage, but I had all the moves. At night Dad used to always sing me to sleep when I was a small child. He would sit on the edge of my bed playing his guitar until I nodded off to sleep. It was a nice way to end every day. He would play all kinds of music to me - including old folk songs, country songs, blues, and, of course, instrumental guitar pieces. I liked the story songs the best, and would listen to the lyrics and ask about what Dad thought the writer meant by certain phrases. Naturally I wanted to play guitar because Dad did, but also because I used to watch that video of Elvis, at this peak, in his ’68 Comeback Special, and it seemed like a very cool thing to do. Living in the age of the home video has obviously been a tremendous advantage. We always had lots of videos of concerts for me to watch, so I was able to, not only hear, but also see what artists were doing. My father is Gary Shepherd. He's been a performing musician for nearly forty years, and has played in all kinds of situations, including solo, bands, folk and country clubs, festivals, and in Pubs and Clubs too numerous to mention. He taught me to play different styles of guitar from when I was 4 or 5 years old. I remember going to a school camp when I was ten years old and getting up to perform on a Red Faces night. I played 3 instrumental pieces, on my acoustic guitar, and once I heard that applause, I was hooked. I knew from that point that I wanted to become a professional musician. Personally I’ve always been a fairly shy sort of person, and it was great to find something that allowed me a means of expression and gave me the ability to connect better with people. I've been very lucky to have been raised in a household filled with music. As I said my father is a very experienced musician who is still actively playing and passionate about his music and particularly guitar, and we often still perform together. I've been exposed to a wide range of musical influences throughout my life. Our record collection at home when I was growing up had everything from instrumental guitarists, to the great singer-songwriters of the latter half of the twentieth century, to jazz, blues, country, classical, rock, pop and almost anything else you can think of. Like I said, wide ranging influences. As a result I can't really say what type of music I like the most. I guess I'd just say I like good music, whatever the genre, and I play in many different styles. Still, as the great folk-blues artist Big Bill Broonzy said, it's all folk music. I ain't ever seen no horses doing any of it. Apart from my father, who has definitely been the major musical influence in my life, I have been influenced by acoustic guitar players such as Jerry Reed, Michael Fix, Naudo [if you haven't seen him play, type in his name on YouTube] and the legendary gypsy-jazz guitarist Django Reinhardt, as well as electric guitar players such as Scotty Anderson, Stevie Ray Vaughan, Eric Clapton, Louie Shelton, Kirk Lorange, and Robben Ford. Funnily enough although I am best known as a solo instrumental guitarist, for the present, I would say I am influenced more by singer-songwriters, such as James Taylor, Peter Cupples, Paul McCartney, John Denver and Stevie Wonder, amongst so many others, than I am by instrumentalists. 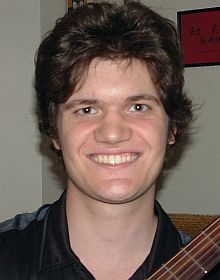 In 2005, at the age of sixteen I entered the guitar competition at the Frankston International Guitar Festival and won the National Young Jazz and Blues Guitarist of the year award against some pretty stiff opposition. The following year I was fortunate enough to perform in the second Celebration of Guitar Concert in Brisbane on the same bill as Michael Fix, Louie Shelton, and Peter Cupples. I've been very fortunate to have performed numerous times with Peter Cupples, who is undoubtedly one of the finest singers and songwriters Australia has ever produced. Over the last 5 years I've been performing fairly regularly at festivals and in clubs, and I completed my University degree in music at the end of 2009. When I was seventeen I completed my first album of original solo guitar pieces. The album is called Finally and can be bought directly from me at gigs, or ordered through my MySpace page. I'm now 21 and I'm currently recording my second album, and I intend to put some of my original vocal tunes on this album as well as some newer guitar pieces. For my instruments, I am endorsed by various instrument and equipment makers. I want to say, however, that I play these guitars and Amps because they suit my playing so well. For the future … I plan on developing a career in music. I realise it's a long and difficult road, but it's the only thing I've ever wanted to do since I was very small. I'm applying to appear at even more festivals this year, and expanding my teaching and looking for more session work at recording studios. If anyone is looking for a guitarist for their recording project or for commercial gigs, I'm available.